Program for creating digital product catalog on CD.The program includes an extensive set of tools for creating a digital product catalog and writing it on a CD. 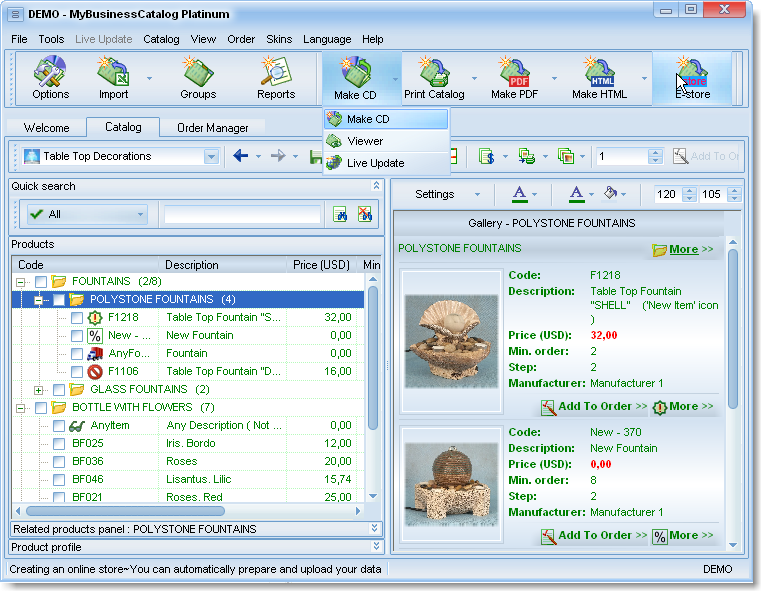 The catalog starts right off the CD and does not require any installations on your customer s computer. The digital CD catalog has the internal means for creating, printing, and submitting order via e-mail and supports updating the product information via the Internet. Hier gehts weiter zum MBCatalog FREE Download. Das Herunterladen der Software MBCatalog FREE 9.0.3 ist kostenlos (ausgenommen natürlich die Kosten für den Internetanschluss und die Internetnutzung). Für die Nutzung der Software gelten jedoch die Lizenzbedingungen des Herstellers/Anbieters.